My only knowledge of Glasgow, Scotland predominantly came from the film Trainspotting which I found out is actually not set in Glasgow but the capital, Edinburgh. Anyway, even without the movie, Glasgow had its image of a rough, poor northern city which is crime-heavy and infested with junkies. I couldn’t tell you that it’s not based on my one day trip to the city center but what I can tell you is that I had a pleasant day walking around the city and I felt safe and secure even with my luggage. An eerie looking city from afar. 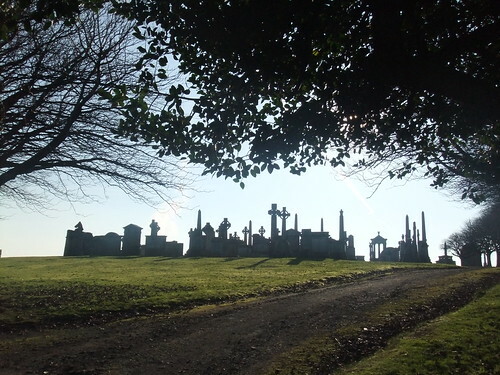 This is entirely new to me as there as no such magnificent burial grounds from where I am from that could compare to Glasgow’s Necropolis. This is the first necropolis I’ve ever been and even though there are no famous people buried here (as far as I know), I am in awe of the place. You could see people buried here from as early as the 17th century and until now their graves are still intact. The place has this serene and ‘holy’ feel to it that it’s impossible for you to run around without feeling chastised by the age-old pillars. What adds to its charm is that it’s up on a hill and looking at it from Glasgow Cathedral makes it look like a small village of its own. 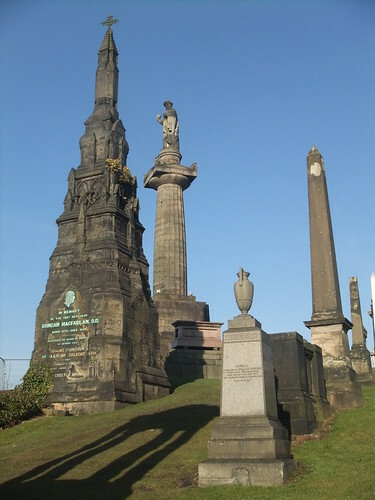 The grand structures that served as a monument to those that passed away. None of them are visited by loved ones. The grandness of this church is simply amazing. 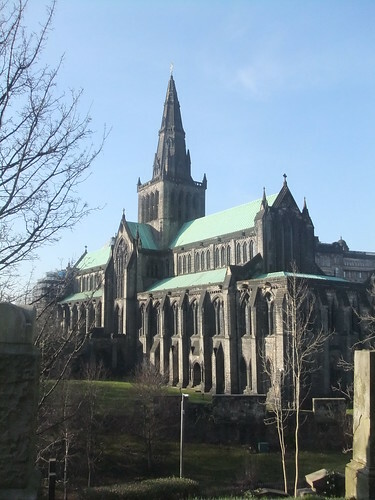 Before reaching the Necropolis, you would have to pass by the millennium old – about that time, before the Reformation – Glasgow Cathedral or the St Mungo’s Cathedral (the hospital in Harry Potter is named after him as well). Again, it’s my first humungous and OLD church visited and I was amazed at how it was restored all these years. 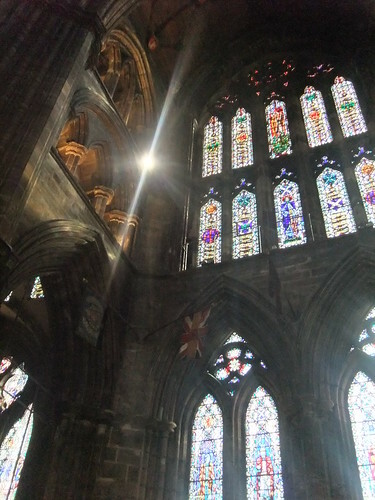 The beautiful glass stained windows are not visible from the outside but when you’re in the building looking at these works of arts are simply breathtaking. Apart from that, there’s nothing much to see inside but might as well go if you’re there. I didn’t know until then… that a Cathedral is called as such because it’s THE central church at that time and is the seat of the bishop. There is a bridge connecting the two which is aptly called Bridge of Sighs because of the sighs from the funeral processions from the cathedral to the cemetery. Also, did you know that in a traditional structure, a church is build in the shape of a cross. 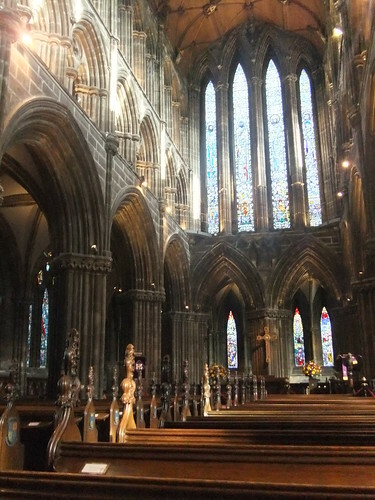 Most old cathedrals and churches follow this architectural design. Look up for that sign to the cafe. Or else you will forever search in vain. After a look around the main shopping district, we then headed to The Willow Rooms as recommended by our favourite guide, the LP. 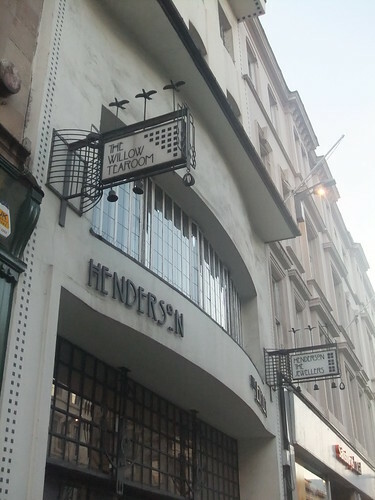 Designed by Charles Mackintosh (yes, the Mackintosh Font! 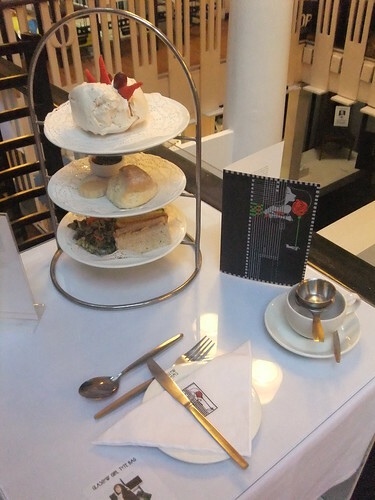 ), the small restaurant serves lovely afternoon tea served on a 3-tiered cake stand. Sadly this afternoon English tea tradition is slowly slipping away from the Brits but this teahouse celebrates it. Albeit in a small and confined space, the experience is well worth a visit. When you’re looking for the place, careful to spot the Jeweler’s place on the first floor. 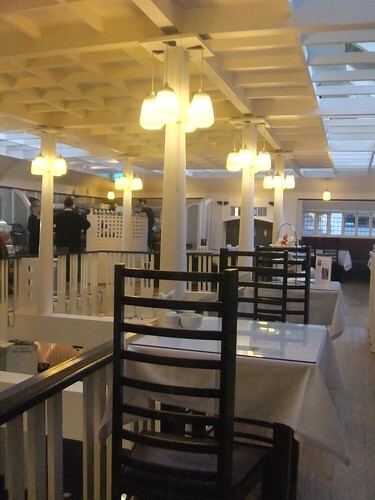 There are no big boards advertising the restaurant but when you look up – you are sure to spot The Willow Rooms sign done in a tasteful manner. Yep, this is what you get – traditional English afternoon tea complete with scones, sweat and savoury items and a nice selection of teas. Nice write-up Jeyps! Makes me want to blog again despite my swamped sked.